Furano Ski Area, located in the heart of Central Hokkaido, is a world class ski resort that has hosted 10 FIS World Cup ski events and 2 FIS World Cup Snowboard events. In addition to these fantastic credentials Furano receives on average 8m of some of the lightest and driest powder snow in the world, as well as being known for its clear blue sky days. 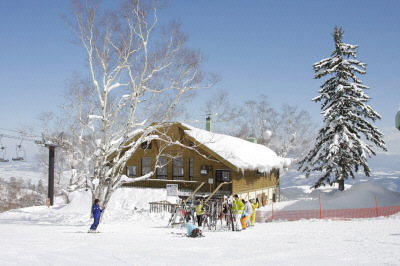 Furano Ski Area is within walking distance from Furano City. With a population of 26,000 friendly locals waiting to meet visitors Furano has a fantastic cultural experience to offer on top of the amazing skiing. During winter regular cultural performances are put on by the locals and the volunteer ski hosts are waiting to meet you and take you for a ski around the mountain. 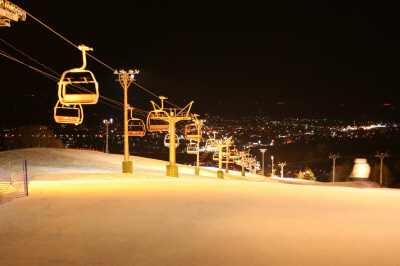 Furano Ski Area is divided into two zones. The Furnao Zone and the Kitanomine Zone. Both zones are interlinked by a chairlift and link run. Lift passes are valid in both zones. 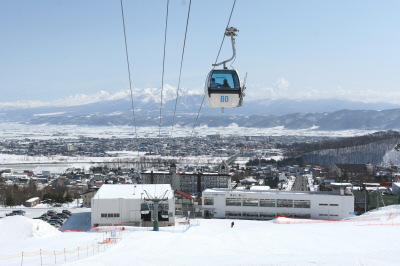 The Furano Zone is serviced by the fastest cable car in Japan, whisking up to 101 people to the top in just one trip. The trip takes only 5 minutes. The Kitanomine Zone is serviced by a 6 person gondola. In total there are 10 lifts serving Furano Ski Area providing access to a variety of beginner, intermediate and advanced runs. Night skiing is catered for on both sides of the mountain providing skiing up until 9pm, and certain slopes are left un groomed after fresh snowfalls for powder lovers. At the base of Furano Zone is Family Snow Land. 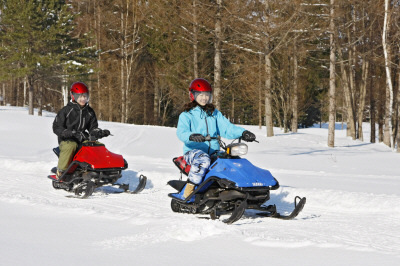 This is the place for the young and the young at heart to experience a variety of fun and exhilarating activities which include: snowmobile rides, snow rafting, snow banana boat rides, snow shoeing, cross country skiing, air bouncy castle, snow tubing and sledding. Furano Hot Spring “Shisai no Yu” is located at the base of the Furano Zone next to the New Furano Prince Hotel. This provides the perfect way to relax after a hard day on the slopes in the therapeutic thermal waters. There is an inside bath, attraction bath as well as outside bath. In addition there is a sauna, relaxation lounge and a variety of massage treatments are offered. Ningle Terrace is an arts and crafts village near the New Furano Prince Hotel. Wander along the boardwalk connecting 15 log cabins in the forest. Each log cabin sells locally made arts and crafts with its own theme. At night the forest is beautifully lit up with hundreds of fairy lights. The ski area itself boasts a total of 5 ski-in ski-out restaurants: Restaurant Downhill (Top of Furano Zone), Nishiki Chinese Restaurant, Ramen Corner, Prince Bakery Pan Kobo (All in Furano Zone); Restaurant Shi Shi and Restaurant Sher (Kitanomine Zone). Furano Ski Area offers first class ski-in ski-out accommodation at the New Furano Prince Hotel (Furano Zone) and Furano Prince Hotel (Kitanomine Zone). In addition to this there is a full range of other accommodation options in the Kitanomine Zone resort area including backpackers, pensions (bed and breakfast style), self contained apartment style accommodation and hotels. In short there is an accommodation option for all budgets and standards. Most accommodation is within walking distance of the lifts. The “Kiminobu Kimura Ski School” is run by 4 time Olympian skier Kiminobu Kimura. Kimura-san and his friendly staff are waiting to help upgrade your technique. Ski and snowboard lessons in English are available. Reception desks are located in the New Furano Prince Hotel and Furano Prince Hotel. 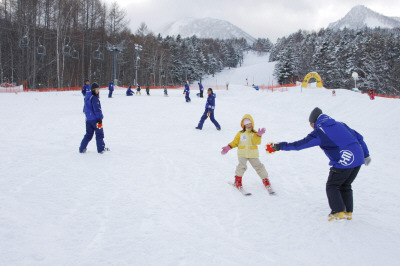 Furano Ski School is conveniently located at the base of the Furano Zone and also offers lessons in English. Furano Ski hosts are free guides who make themselves available to show guests the best of local skiing and boarding at Furano Ski Resort. While touring the mountains the guides offer valuable local information that guests simply cannot go without during their stay in Furano. This is a great chance to meet and make friends with a local. Bookings can be made at the Furano Tourism Association office. Up to date rental equipment is available in 4 convenient locations on the ski area: the New Furano Prince Hotel , Furano Ropeway base station (Furano Zone), Furano Prince Hotel, and under the Kitanomine Gondola Station. Ski and snowboard equipment as well as clothing items are available. 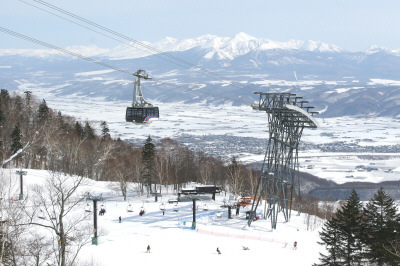 Furano Ski Area’s point of difference is that it is not just a stand alone ski resort. 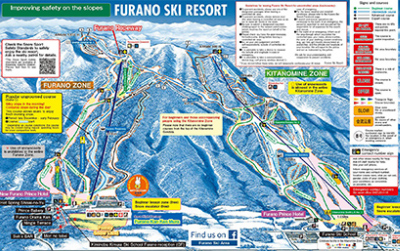 Furano Ski Area is located just a few minutes from the city of Furano. Many people walk from the slopes down the hill into the city centre…it’s that close. Having a city next to the ski resort means you will have a genuine Japanese cultural experience as well as having a fantastic ski holiday. The city is bursting with bars and restaurants run by locals waiting to make your holiday in Furano so much more than just a ski trip. Visitors have the opportunity to explore the backstreets of Furano and slide open a rice paper door to open up a true cultural experience. During the peak of the winter season cultural performances are put on by locals as a way of welcoming international guests to the city of Furano. Local performing arts groups will present a variety of performances such as the “Famous Belly-button Dance”, traditional folk music, swords dances and calligraphy demonstrations. This is an event not to be missed and is often rated by guests as the highlight of their stay. Around Furano other attractions include a winery, cheese factory, art gallery, photo gallery and a number of hot springs in the Tokachi mountains. Other popular destinations for a day trip or half day trip include Asahikawa City and Asahiyama Zoo where you can view the famous penguin walk. Asahikawa City is easily accessed by a bus or train trip (approximately 1 hour from Furano). With a population of 300,000 people and most large chain stores and department stores represented it is a popular destination for a shopping trip. No visit to Furano would be complete without visiting a snow dome ice bar. These have become a tradition, and you couldn’t ask for a better location for a photo opportunity, as well as being able to enjoy an après ski cocktail and snack in a dome constructed of snow and ice. Furano is a perfect base to take a day trip and explore nearby ski resorts. During the main winter season regular bus services run to nearby ski areas that are well know for their off piste skiing. A local company also offers guided off-piste back country tours, with the opportunity to ski a live volcano. 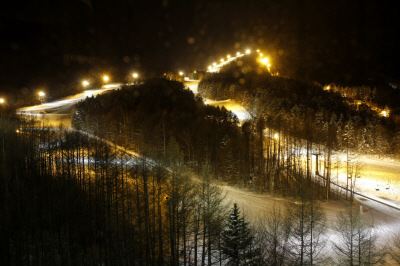 The office is conveniently located at the base of Furano Ski Area’s Kitanomine Zone. Furano Tourism provides information services and a tour desk for booking various activities. The friendly bilingual staff are waiting to assist you in anyway they can to make sure your stay is as smooth and enjoyable as it should be. Be sure to pick up your free copy of the Furano Tourism Associations “Dining and Entertainment Guide” on arrival. This is booklet is packed full of information in English (more than 80 pages!) that you simply can’t do without during your stay. It is available from the Furano Tourism Association and most accommodation providers. From New Chitose Airport there are regular bus service that run directly through to Furano. These must be booked in advance. From Asahikawa Airport the local bus service “Lavender-Go” runs through to Furano. From Sapporo City there are options of either bus or train running through to Furano.